Bray has called also for increased investment in the education of the girl-child and greater political participation of women in Nigeria. Bray spoke in Lagos at the 2018 International Investment Conference with the theme: “Promoting Investment, Connecting Business,” organized by the Lagos Chamber of Commerce and Industry (LCCI). He said American investors have issues with how policies are made and changed, noting that it has the capacity to discourage investors in the country. The envoy said the development has the capacity to discourage any investor as there is no clear-cut obedience to rule of law to protect investors. He argued that the country has image problem which needed to be addressed urgently. Bray noted that though security concerns remain an issue, it is not enough to discourage genuine investors as what they need to do is just to take care of their personal or corporate existence. On infrastructure, he advocated the building of competitive infrastructure and stressed the need to connect cities and states for easy movement of goods and services. In another development, Bray has called for increased investment in the education of the girl-child and greater political participation by women in Nigeria. Bray in his keynote address on the second day of the 17th Annual Conference of Women in Management, Business and Public Service (WIMBIZ) in Lagos recently said: “Nigeria cannot achieve its dreams of a prosperous and inclusive society without reinventing its approach to how it is treating the overwhelming majority of the women and girls living in this country. 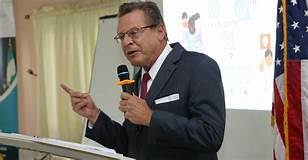 A statement by the Public Affairs Section (PAS) of the US Consulate General said Bray spoke on ‘Unstoppable You: Reinvent and Reinvigorate’ at the event attended by leading women from both the private and public sectors, and encouraged the women leaders to continue working to promote gender equality in Nigeria. He lamented that Nigeria is reportedly home to the largest number of out-of-school children in the world, and many of them girls. “If Nigeria properly invests in the education of women and girls, how many more Amina Mohammeds will represent this country on the world stage? If more women and girls are given equal opportunities, how many more Chimamanda Ngozi Adichies will be able to tell stories that enthrall the world?” Bray asked. He challenged the conference participants to press for greater involvement by women in the country’s politics, noting that removing the barriers to women’s full economic participation is important to an inclusive and prosperous Nigeria. He said: “WIMBIZ and various Nigerian women’s organizations can help Nigeria decide the course of its future and chart a course that will lead to a democratic and prosperous nation. You can start by working to ensure that the 2019 elections are free, fair, credible, and peaceful. That would be a great start,” the Consul General added.